Puppy In My Pocket® – those adorably fuzzy, irresistibly tiny, pocket-sized puppies – are back and ready for super-sized success. The loveable little Puppy In My Pocket® pets launched Fall 2015 with over 100 different collectible figures – as well as playsets, carry cases and wearable accessories. With their endearingly realistic designs, highly detailed features and soft, fuzzy coats, Puppy In My Pocket appeals to every child who dreams of owning her very own pets. And, the brand’s sweet simplicity resonates with parents of young kids everywhere – especially those parents who owned and loved In My Pocket® toys when they were little. Founded by former Mattel EVP of Marketing, Joe Morrison, MEG Toys is a leading owner, creator and developer of a wide range of successful Intellectual Properties, including the “In My Pocket®” Franchise. MEG Brands have sold a BILLION collectible figures worldwide since the company was launched 25 years ago. MEG is proud to partner with Just Play, the manufacturer and distributor of exceptional children’s consumer goods, to introduce the beloved Puppy In My Pocket® and the In My Pocket® brands to a new generation of kids. Launched Fall ’15 – exclusive at Toys R Us. Launched to all stores Jan ’16. Launched Fall ‘16 – exclusive at Toys R Us. Launched to all stores Jan ’17. Puppy In My Pocket® and all the In My Pocket® brands have international distribution in Canada, Mexico, Latin America, South America, Australia, New Zealand, Europe and Southeast Asia this year. What makes the In My Pocket® franchise unique? The pocket-sized collectibles lines, Puppy in My Pocket, Kitty in My Pocket and Jungle in My Pocket, are endlessly extendible with additional pet iterations to follow. ALL are based on real breeds! With 100’s of new puppies, kitties and jungle pets, as well as playsets and accessories, girls will love collecting and taking care of their new friends. They have realistic and highly detailed features with soft, fuzzy coats! Every puppy, kitty and jungle pet has a name, unique bio and is based on a real breed. A Collector’s Checklist is included with each series to help collect them all. Accessories include carriers, connectable towns, and clip-on pouches. 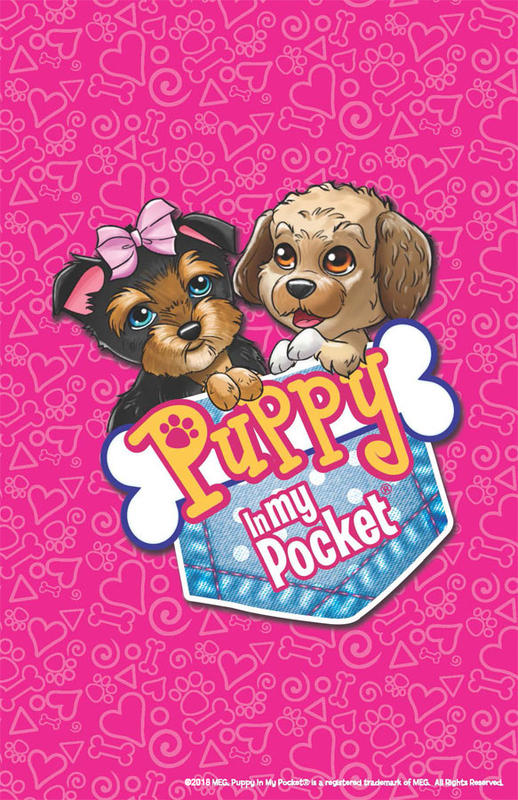 ©2019 MEG Puppy In My Pocket©, Jungle In My Pocket© and all characters and likenesses are registered trademarks in the U.S., the European Community and in other countries. All Rights Reserved. Interested In Becoming A Puppy In My Pocket Licensee?